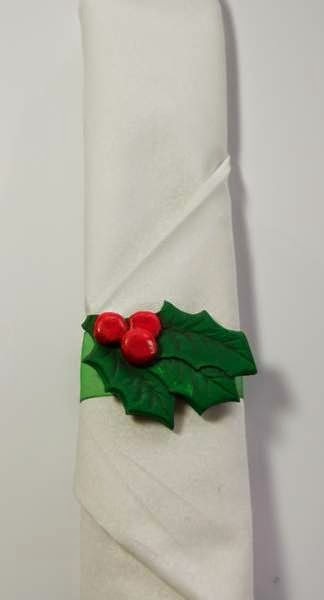 Brunches, luncheons, dinners, garden parties, whatever your get-together these napkin rings can be customized to make your table setting as unique as you are! I've included some patterns to get you started. 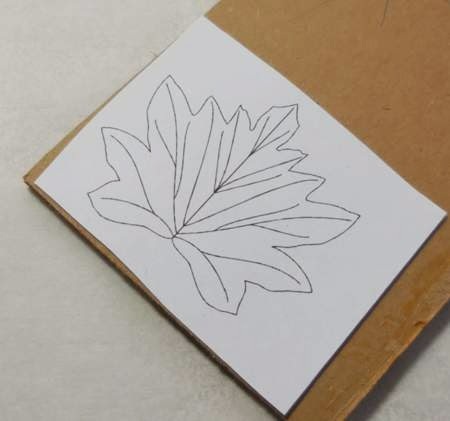 First I'm going to show you how to make quick stamps for the clay - one that presses the design into the clay, and one that leaves a raised design. 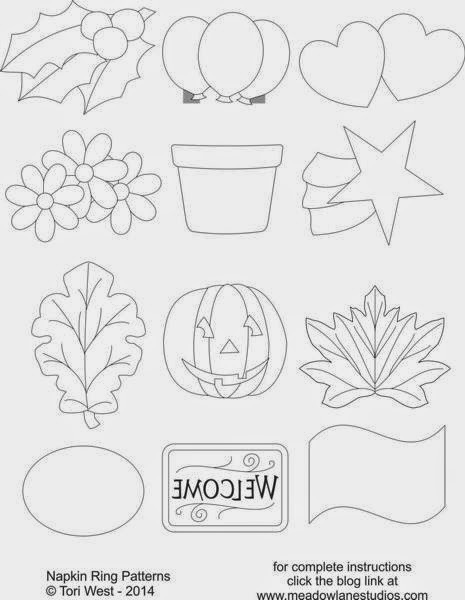 For the first one, I'll be using the leaf pattern for an example. 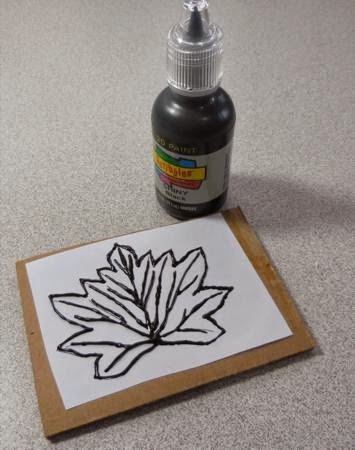 Print and cut out the design and glue it onto a piece of cardboard. Trace lines with 3-D paint, then set aside to dry. 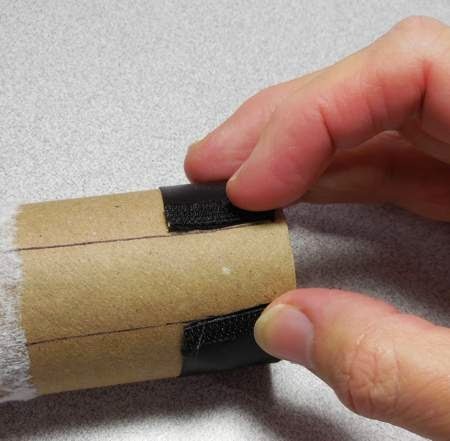 Trim around the pattern, turn the stamp over and attach a strip of masking tape for a handle, as shown. 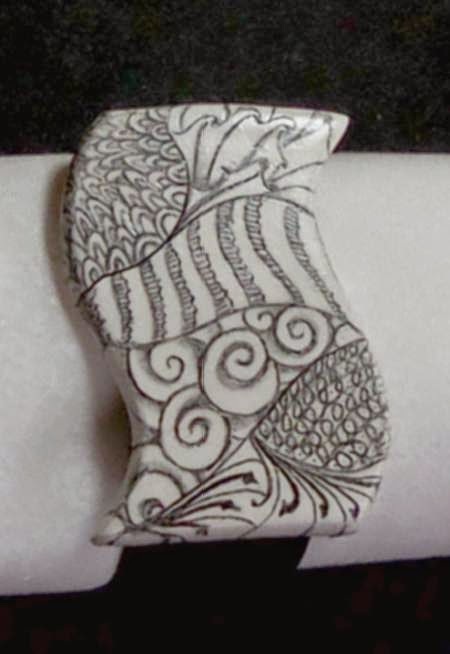 To use your stamp, roll out paperclay to desired thickness (1/8" is suitable for all of these napkin rings) using a soft brush, dust a layer of powder over the stamp and a light layer onto the surface of the clay. 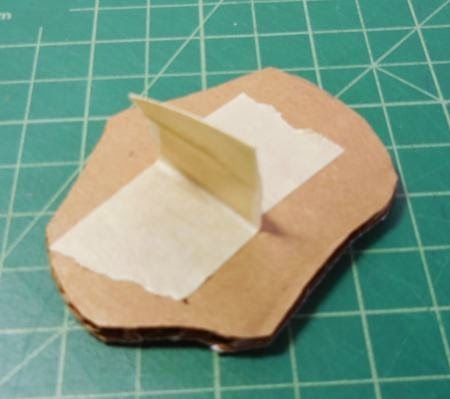 Press stamp into clay, with fingertips, firmly press all over the top of the cardboard to make sure the design is transferred to the clay surface, but not so hard as to indent the cardboard or cause the clay to come up over the edge of the cardboard. 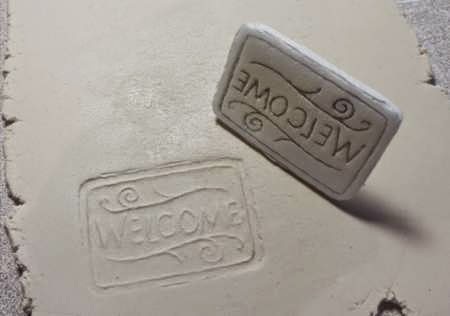 Lift stamp from clay carefully. cut out desired pattern, leaving about 1/4" around the outside, and tape to styrofoam sheet. 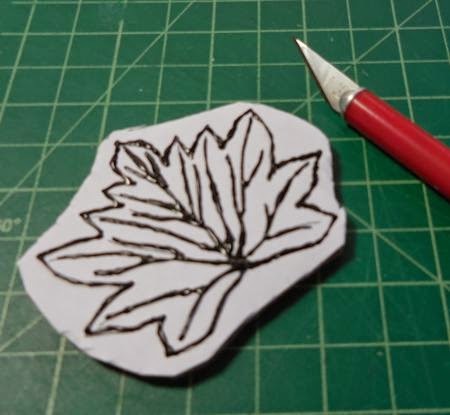 trace outline with sharp pencil, pressing firmly into the pattern to indent the design into the foam underneath. Don't press so hard that you go through the pattern, although that may happen in a few spots. 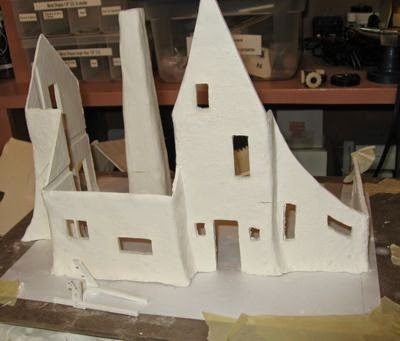 Anywhere away from the pattern, poke a hole through the paper and into the styrofoam. This is so you can line the pattern back up if you see spots that weren't properly transferred. Before removing the tape, lift a corner of the pattern and make sure you can see all of the design. If not, put the pattern back down, align with pencil hole, and re-trace the missing areas. 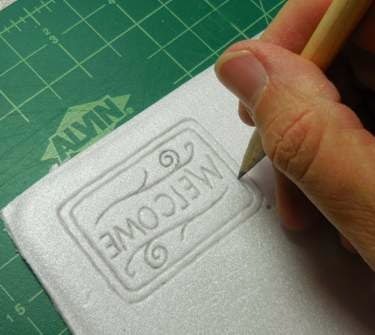 If your design is completely visible on the styrofoam, lift off pattern and trace over design with pencil. 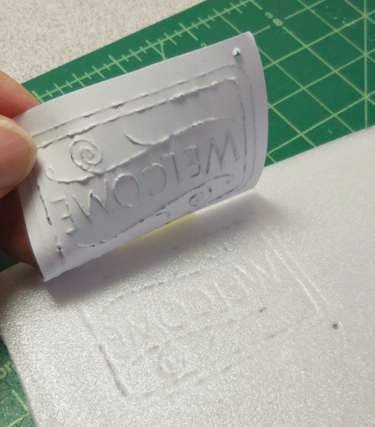 Use your craft knife to cut the design out of the styrofoam, attach a tape handle to the back, as shown for the first stamp. Use this the same way, powdering in between stamping into clay. 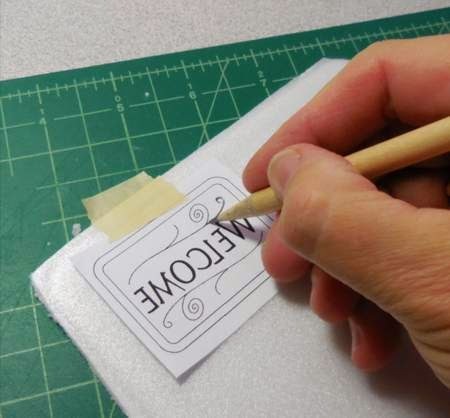 If some of the design doesn't show or you'd like some of the lines to be thicker, adjust your stamp by going over those areas again with the pencil. 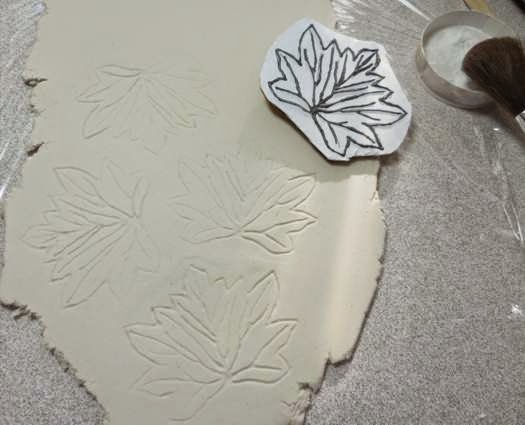 Stamp designs into clay, cut from clay and set aside to dry. 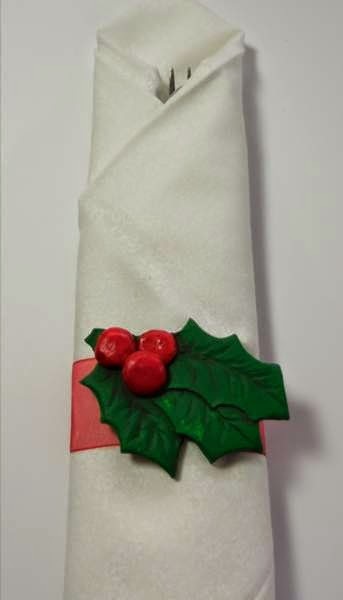 While you're waiting for the paperclay to dry, cut the 1/2" bias tape into 1 1/4" pieces, one for each napkin ring. 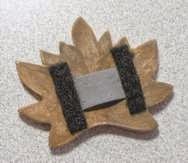 Open the bias tape pieces and glue down the flaps on each side. Set these pieces aside to dry. 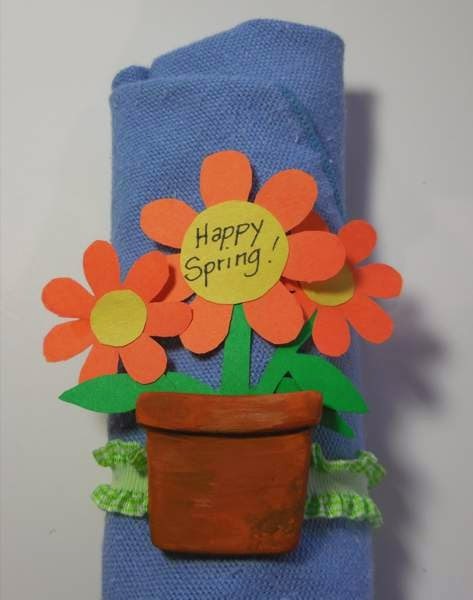 When all of your napkin ring clay pieces are dry, paint and decorate as desired. I used acrylic paints, metallic watercolors, and satin and gloss acrylic varnish. 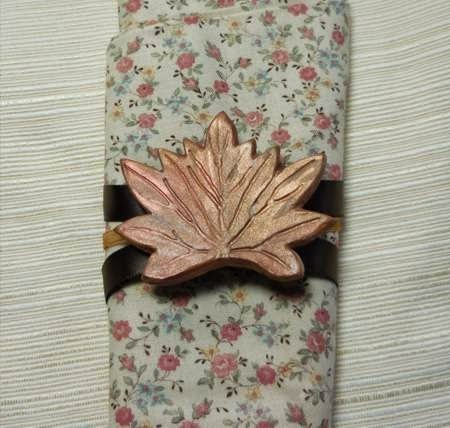 The part of my design that makes these rings so versatile is the arrangement on the back. 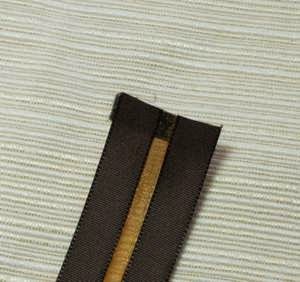 It consists of one horizontal piece of bias tape with vertical strips of hook and loop tape on either side. 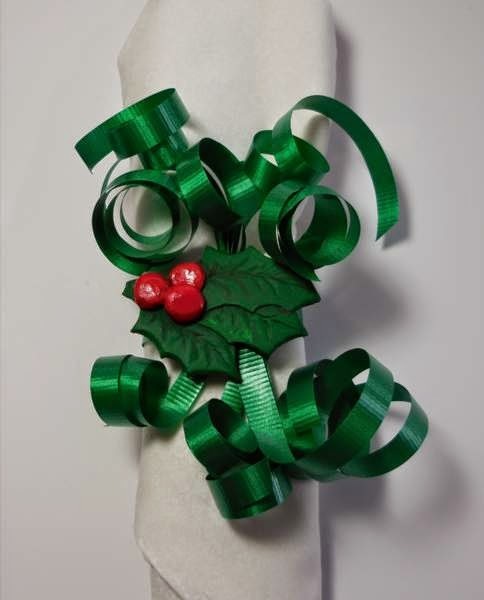 With this configuration you can change the ribbon or "ring" part of the napkin ring, and/or use the horizontal section for adding ornaments, tags, tucking things in or tying things on! 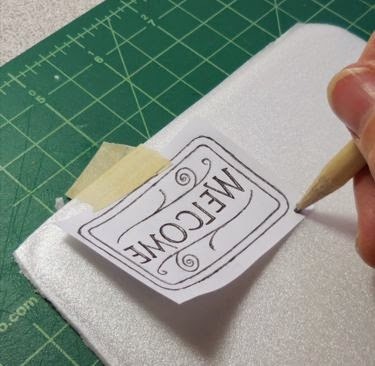 Begin work on the back by making a spacer from aluminum foil. Use a piece of foil about 2" x 12" and fold the short edge in approx. 1/2". continue folding until you've used the entire strip, then press the layers together well. 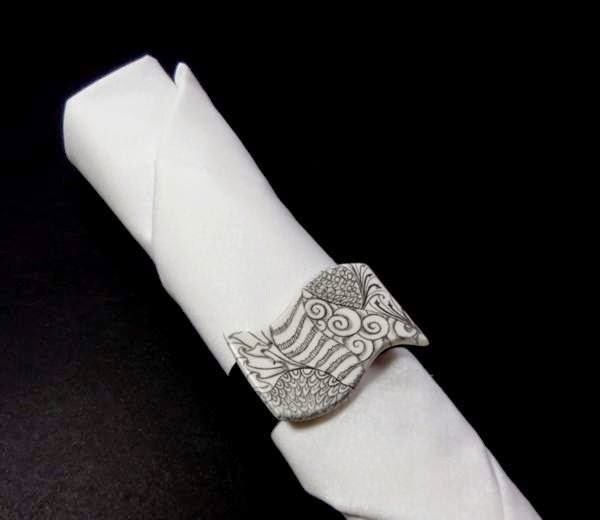 Place the spacer in the center on the back of your napkin ring piece. 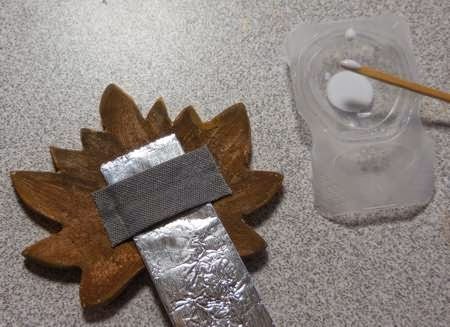 Put glue on each side of bias tape and glue over the spacer as shown. Press edges down firmly, and, after a few seconds, remove the spacer. 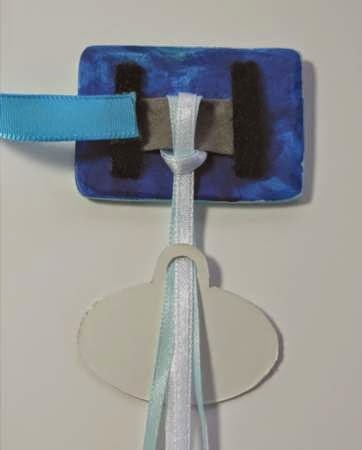 When the glue has dried on the bias tape piece, add loop portion of hook & loop tape to sides, as shown. You don't have to use 1" ribbon, you can group smaller ones together, or, cut the hook tape to a smaller size for small ribbons. 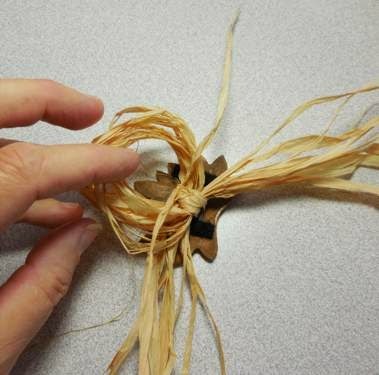 For a raffia ring, tie bundle around tube, place knot at back of clay piece, pull some strands from each side through the bias tape and tie in place. Bring strands around to the bottom of the tie and tie loose ends together. 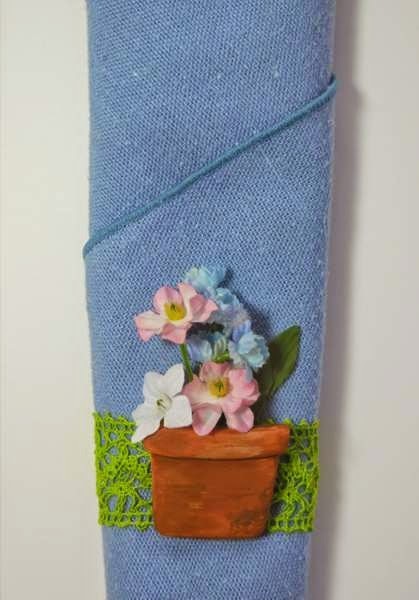 The clay pot design was made for tucking flowers into the bias tape section, and adding any variety of ribbons to the hook & loop tape. 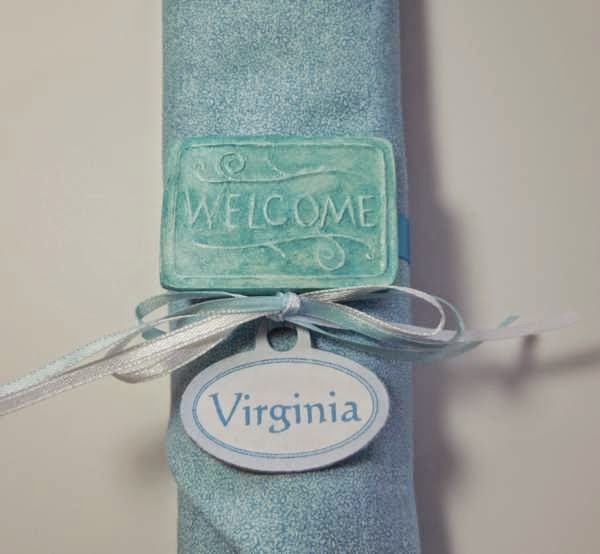 Use the welcome design with just a ribbon, or attach a tag (or charm, or?) 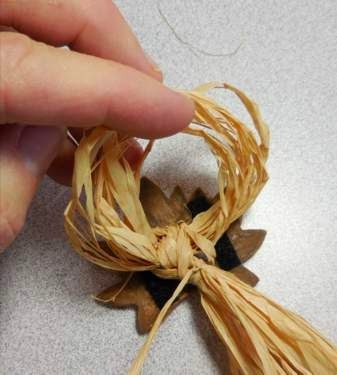 by passing small ribbons through the bias tape section & tying a "lark's head" knot, bring the ribbons through the back side of the tag, then turn the whole piece over, bring the small ribbons to the front of the tag and tie a bow. 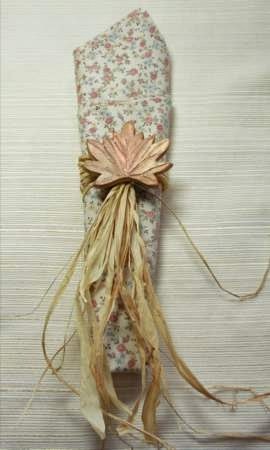 The possibilities for ribbon combinations & clay decorations are endless! 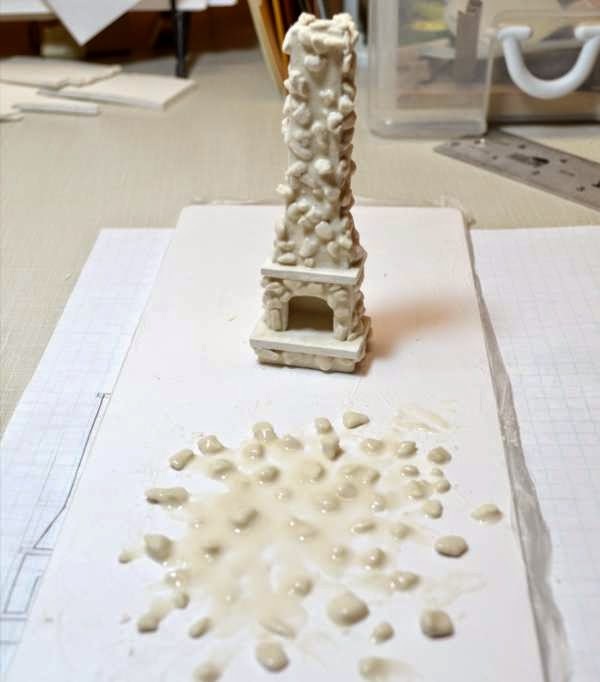 I believe the most common use for Creative Paperclay®, among miniaturists, is as a covering on pre-made structures. Once I had the floor plan designed for my witch house, I started thinking about how I was going to make the structure itself. 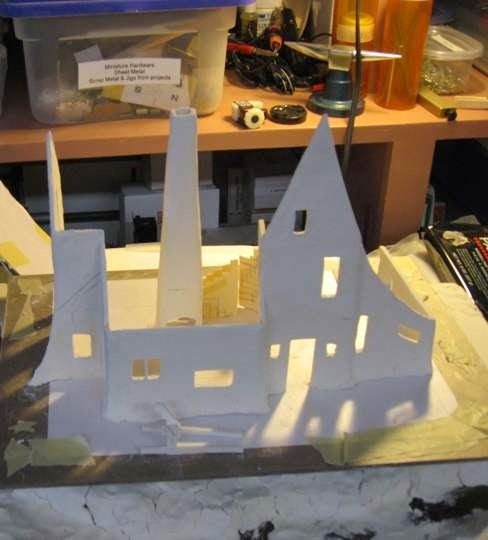 I designed the sides and roof, then made a small paper model to see how it would all fit together. 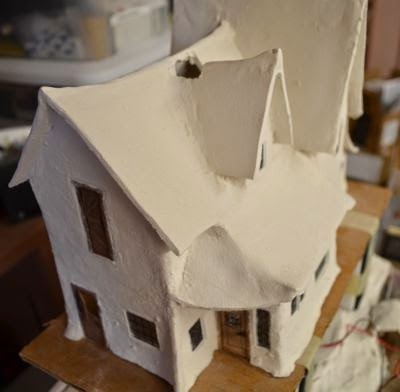 I was going to make the structure out of wood and cover it with paperclay – but, I started thinking that in quarter scale I might as well just make the walls out of clay. It was then that I decided to make the entire project completely out of paperclay. As most of you know, I LOVE the stuff! My first thought was to cut the wall patterns out of dry clay and then assemble the structure, but I wanted a more “organic” feel to the piece. I came up with a plan to make an interior form, cut the pattern pieces from cardboard, and glued, taped, and glued some more. 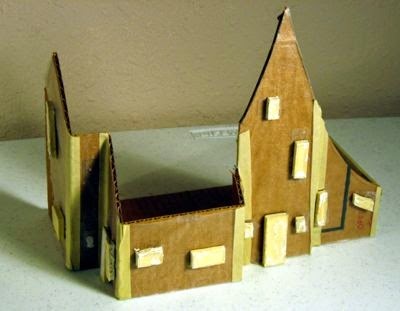 I used the floor plan, minus the width of the cardboard on all sides. In order to accurately follow the plan, I had to figure out where all the pieces where going to overlap in order to make the wall patterns and adjust the widths accordingly. 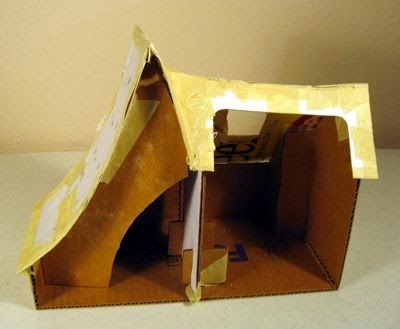 I then covered the entire exterior of the cardboard with plastic. I had already drawn the windows onto my pattern, so I transferred them to foam core, cut them out and wrapped them with masking tape (so the paperclay wouldn’t stick) the affixed them to the structure with double-stick tape. As you can see from the photo, some of these walls are pretty high. I knew that once I started adding clay to the structure the cardboard would start to bend, so I also glued some additional cardboard supports behind some of the walls. I also taped wood strips to the cardboard model (not shown in the photo) before I covered it with clay. The strips were used to create guidelines for the second floor, and for electrical wiring. 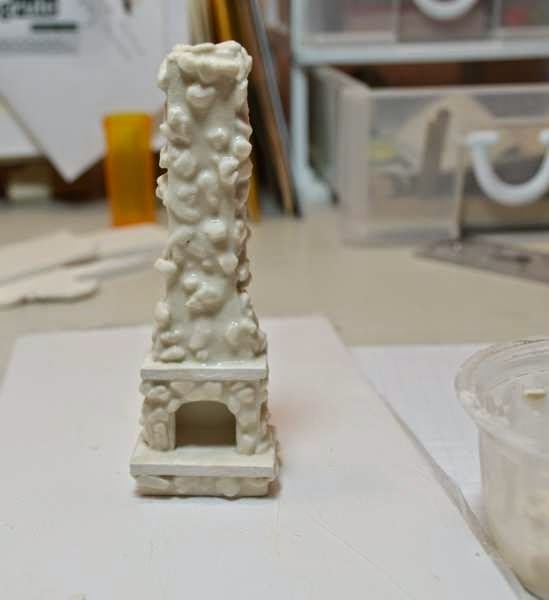 I rolled paperclay out to a 1/8″ thickness and applied it to the form, making sure to go around all the windows and doors carefully. 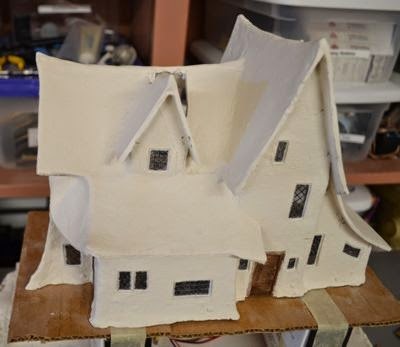 This is how the house section looked when removed from the form, with the exception of the center divider in the front window, which I added with a strip of dried paperclay. 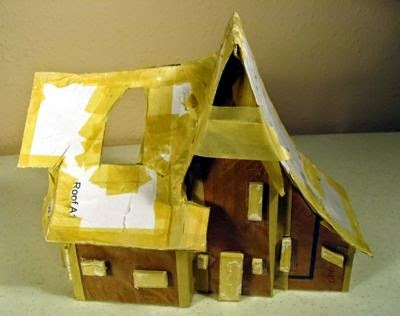 For the roof piece, I followed the same procedure but used cereal box type cardboard so I could bend it to the form. I don’t have photos of the roof section when it came off the mold, I was too anxious to attach it to the rest of the house! Already had the doors and windows in, since I started with the gate & doors. I’m signing off with these last two photos – next time I think I’ll move on to the stairway or fireplace. 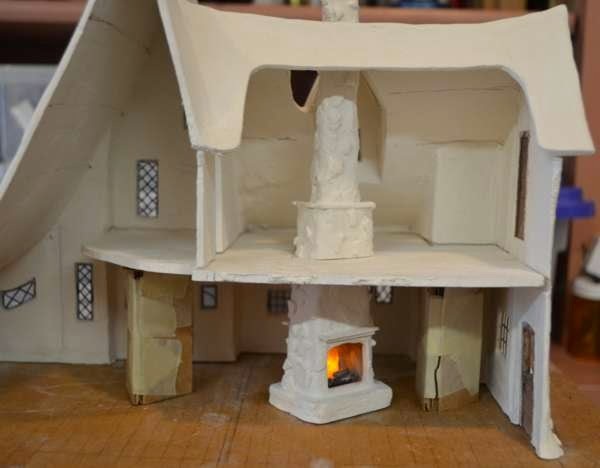 This was the original fireplace for my version, which I created by cutting dry paperclay to size and cementing together with fresh clay. This is the modified fireplace – I cut a section out of the original version, added a mantel, then cemented the top portion back on. 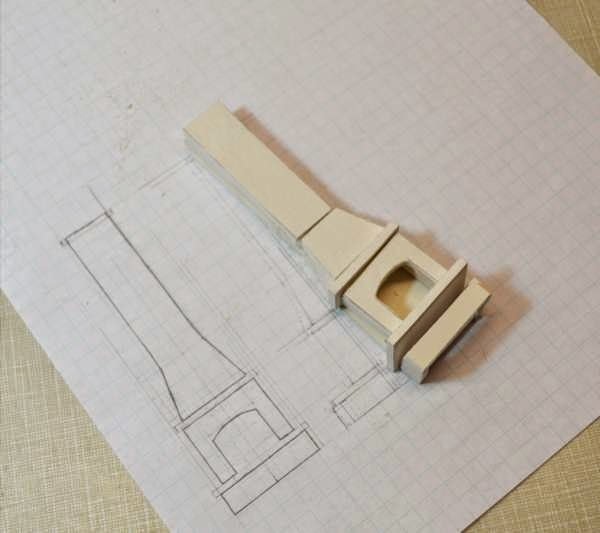 The fireplace is also cut so that the top portion can go on the second floor (easier to cut the fireplace than to line it up with a hole in the floor, besides, I haven’t decided on the exact placement yet). The second floor is not installed at this point, I’m still in the “dry fit” stage. The cardboard supports are holding the floor in place while I test fireplace placement, stairs, layout, etc. 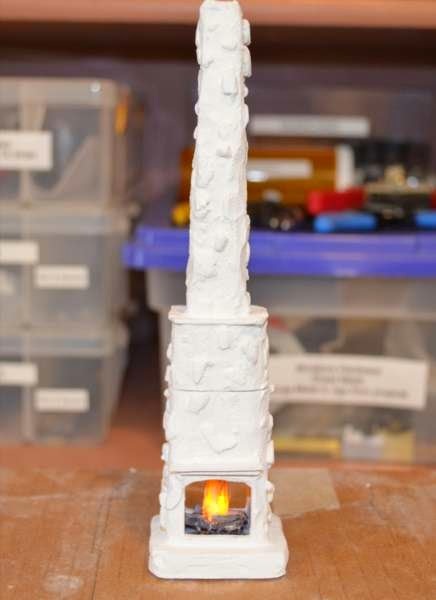 Since I didn’t take photos of my fireplace during it’s creation, and since I need another quarter-scale fireplace for a different project, I’m going to share in the following photos the technique I used for this one. It’s a fun, simple way to get the rock look. 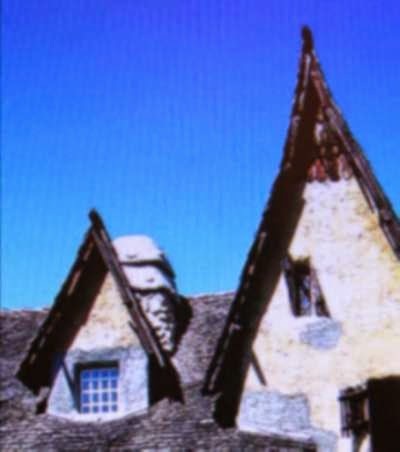 I’m sure there is a name for this type of rock work, which is popular in storybook style homes, but I don’t know what the name of it is. 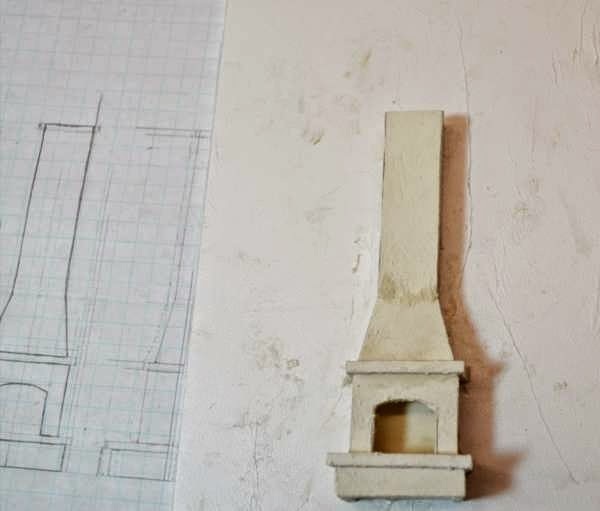 The demonstration fireplace is a different style, and is for a one story building, but the process is just the same as I used for the witch house fireplace. 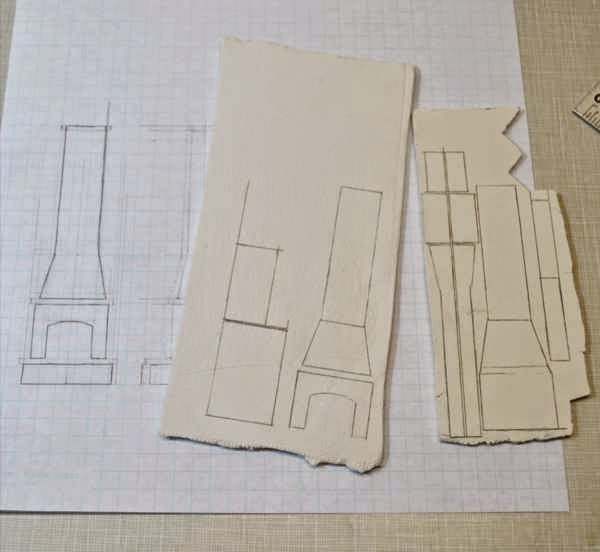 The first step is to design your fireplace, create a pattern and transfer it onto a sheet of dry paperclay. 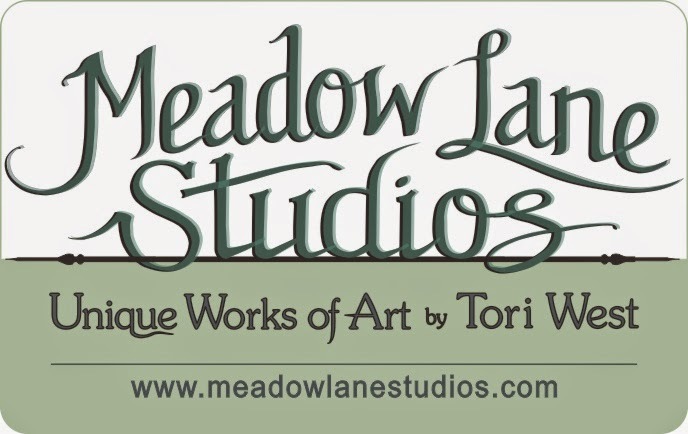 I’m using 1/8″ sheets for this project. 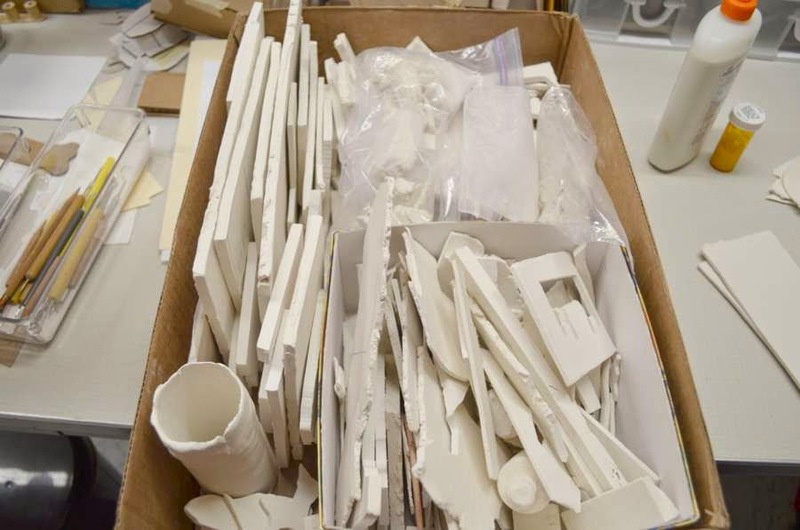 (Thought I’d share a picture of part of my dry clay stash with you too – yep, at all times I’ve got dry sheets, baggies of bits, carving and turning blanks, slip, powdered clay, and of course packages of fresh clay :) ). 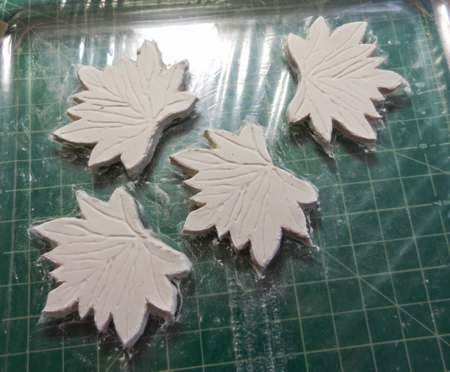 Cut pieces from clay and “dry fit” to see if they are going to work the way you planned. Sand or adjust as needed. Remember to wear a dust mask when sawing or sanding dry clay! 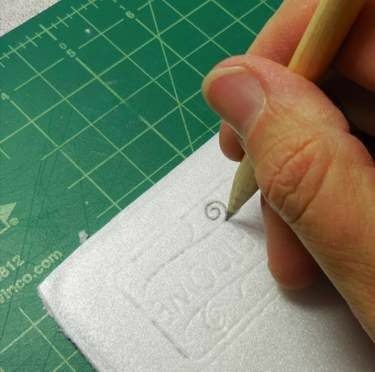 Cover a piece of flat foamcore or board with plastic wrap, or use a ceramic tile or plastic surface as a base for assembling the pieces. Wet the assembly board, then place the back piece onto it and move it around in a small circle until it starts to stick to the base, then move the piece a little bit at a time until it’s stuck down solidly. This will keep your project in place but allow you to peel it off later. Wet clay pieces, then join together with fresh clay. Allow the clay to dry, then peel off work surface. 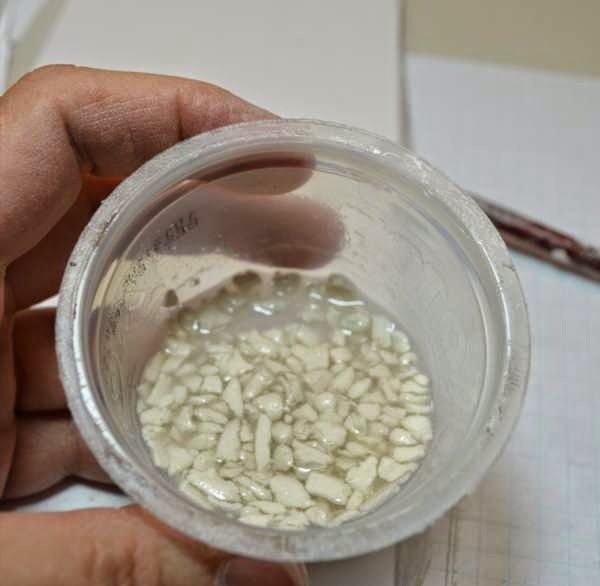 Next you’ll need your baggie of bits of dry clay. 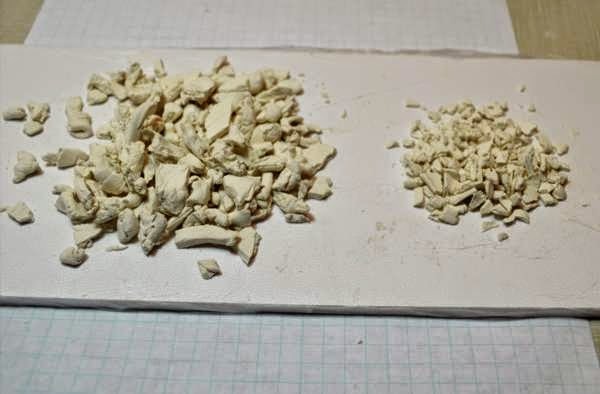 These are the leftover pieces of clay from sculpting that have dried out, or scraps from cutting or carving clay. If you don’t have any, you can break off bits from the dry sheet that you cut the fireplace pieces from. I’ve dumped my baggie out and sorted into the size of stones I want for the fireplace (small ones on the right, since this is quarter scale), and broken up some of the larger pieces in order to have what I think will be enough to cover the fireplace. Now take the bits, put them into a container, and add enough water to cover. 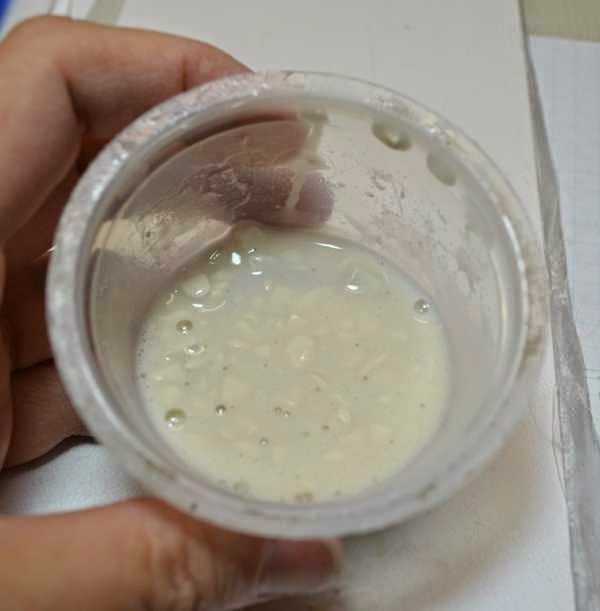 Stir until the edges of the pieces start to soften and the clay is somewhat dissolved. It’s up to you how much you want to stir and round the edges of the “rocks”. Obviously, you don’t want to completely dissolve them. 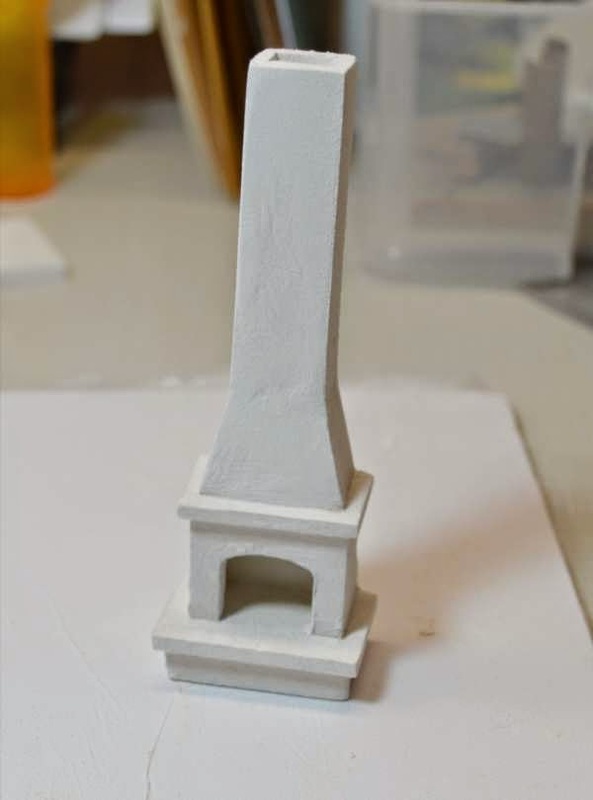 All that’s left is to paint it on and let it dry. 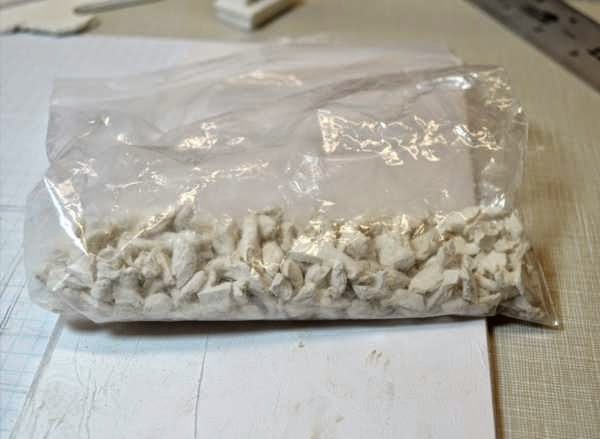 If you have extra rock mixture just spread it out on the board and when that dries you can pick the rocks back off of it and throw them back in the baggie. This entry was originally posted on April 28th, 2014.